With thy Needle & Thread: Welcome October! You can simply right click on the photo and select print option from right here. IMPORTANT ~ this chart is for your own personel use. Chart may not be printed and sold, shared electronically via email, websites or blogs, or used as a free hand out. Thank you for such an adorable pattern! I can't wait to stitch this one! Love it Brenda !! I will have to work on this one at night... I am stitching away on Kind & True !!! I love it, Brenda! Thank you!! 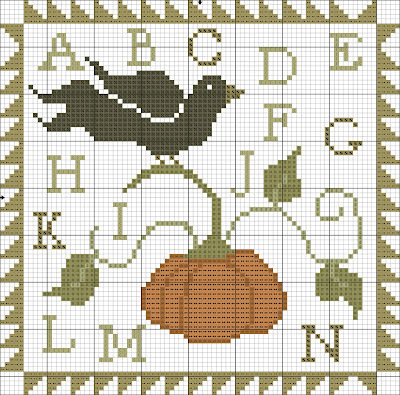 Thank you for the gorgeous Autumn pattern! Thanks so much for this pattern. I have been cross-stitching a lot lately and can not wait to finish my projects and get to this one. I appreciate your generosity very much! Thank you for creating such a lovely xstitch for us. you are so talented. Happy fall! OH, how cute!!! Thanks so much for this free pattern!!!! LOVE this adorable free pattern! Thanks for doing this for us! Lovely, look forward to startng this one, thank you kindly. Thanks, Brenda ~ it's wonderful. Such a wonderful treat! thank you so much, i was looking for something to do, now i have something. Thank you so much Brenda for this freebie! I will have to get my needle and thread out and start it right after i get home from watching iowa state beat kansas state! Thanks so much for the fun pattern - can't wait to stitch this up! Thank you so much for this beautifull chart ! I just finished pumpkin patch and posted a pic in my blog. It was so much fun to make that one. very beautiful thank you very much ! Thank you for the beautiful fall pattern!! thank you for this wonderful chart!!!! i hope to stitch it as soon as possible!!! thank you for this lovely design. I stitched it and it looks great. You can see it on my blog. If you want, you can take the pictures to show it on your blog. Wow, I love it. Pumpkins are my favorite. Thanks so much for this. Thanks for the beautiful chart. Thanks Brenda, I just adore this pattern! Free Shipping at Country Stitches!